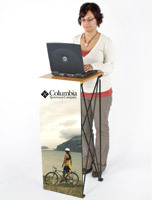 Is your business in need of a laptop podium for multimedia presentations, speeches or to provide additional work space? 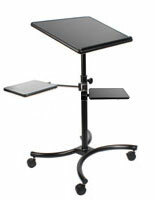 These portable notebook computer stands are designed for holding and moving projectors, lightweight PCs, CPUs, tablet keyboards and other pieces of smart technology. 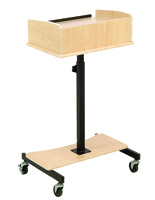 The construction of the notebook lecterns is designed to be both attractive and durable for heavy use in public environments. 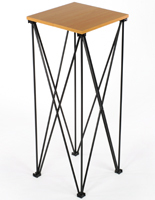 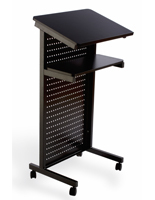 Laptop podium lecterns, like other mobile computer stands, are made using wood, steel or some combination of the two, and feature stylish laminate overlays in several different finish colors. 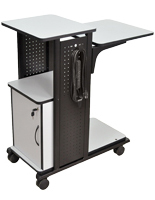 This office furniture is designed to be compact and can be easily stored in an out-of-the-way corner or in a provided carrying bag. 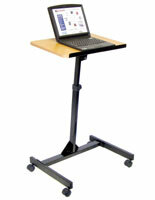 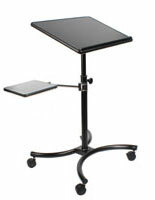 Laptop podiums on wheels with adjustable height are able to adapt to different users quickly and efficiently. 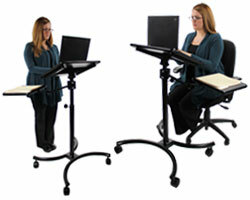 Professional notebook computer stands at full height will accommodate speakers that are standing and can change to a lesser measurement if users desire to be seated. 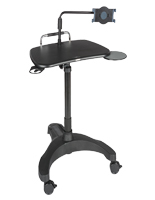 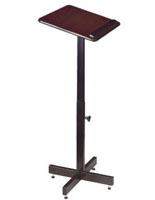 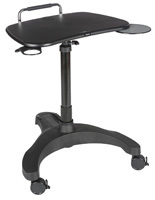 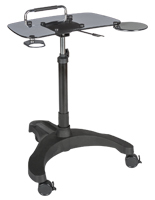 The classroom or office lecterns are great tools no matter in what setting they are used. 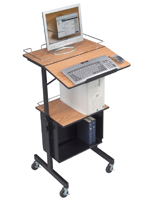 What practical features do notebook computer stands need? 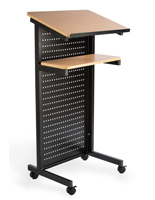 Podium stands for laptops come with optional storage or shelves that will allow for other items and peripherals such as keyboards, mice or smart technology projectors, to be safely stowed or accessed for use. 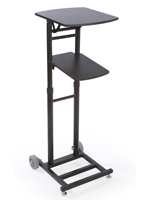 While the great majority of these laptop carts have adjustable height, some of them actually use pneumatics to do the lifting. 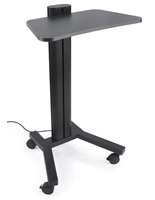 Instead of turning a knob to bring the stand up to full height, this type of small presentation desk just requires the pressing of a lever. 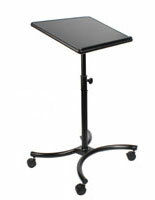 Portable podiums, which frequently have wheels for mobility, do come in stationary or fixed form as well. 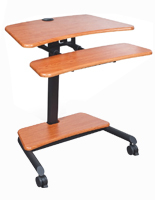 A few of these wood computer desks come with leveling feet to help keep multimedia or banner presentations stable even on classroom flooring that many not always be level. 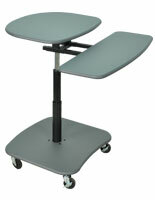 There is even a wall mount option for the convenience of office furniture without taking up floor space. 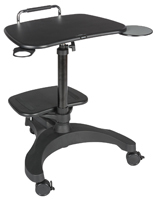 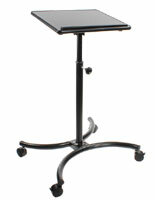 Computer workstands can be used in many places, including classrooms, churches and tradeshows, among others. 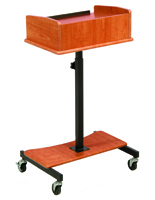 Some models are better suited for convention booths than others, like those podiums that are stationary or come with locking wheels. 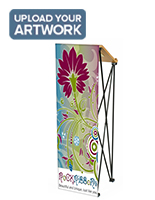 Being able to have a computer desk with a banner attached to promote your company at a trade show is also a great bonus. 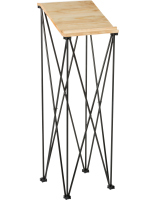 Full height models are also a big bonus because people won’t have to sit down to check out information on your services. 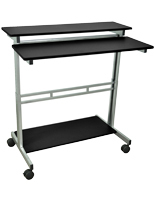 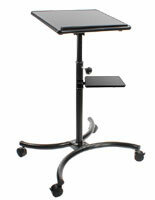 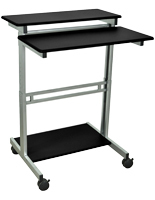 Having a mobile unit is a big plus if the laptop cart is going to be used in school or university classrooms. 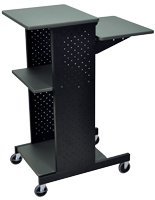 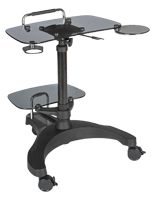 These lectern-top storage carts on wheels are even more useful when the adjustable height can be utilized as well to aid in a multimedia presentation and serve as a workstation in the same room during a single class period. 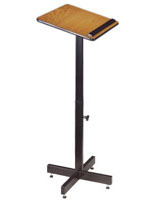 Those churches that use projectors or other smart technology during a service or schooling will like the compact nature of the lecterns so they don’t detract from the message being played and don’t get in the way of parishioners. 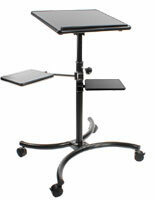 The mobile office furniture also makes it easy to move them during church time if needed.